Many CIOs can be intimidated by the world of finance. The challenges associated with moving money around from one investment to another, and the use of esoteric financial terms can place people well outside of their comfort zone. However, most CIOs take their own knowledge for granted when it comes to IT investing. For example, I recall working with the director of a budgeting office for state government. There had been a recent surge in media coverage of a conference that took place in an upscale resort town, and many of the taxpayers were expressing outrage at "how we are spending our tax dollars". As a result of the media coverage, the budgeting director decided to implement video conferencing. After researching the topic, he decided that everyone in the office was going to be provided with a webcam and would start using a free Web‐conferencing service to collaborate with other divisions. The idea was to "use video conferencing" but keep the cost below $25,000. At this price level, the requisition could go straight to the purchasing office, with no formal RFP process. Any CIO who has been in a similar situation can see a large number of potential implementation issues with this video conferencing plan, including bandwidth, video quality, and what equipment (if any) would be on the other end of the call. In this instance, the role of the CIO was to illustrate to that director that the proposed solution would not work, and then make sure the State CxOs were aware of the need for video conferencing. By simply understanding the complexity of IT, and applying your understanding to typical situations, your knowledge is ideally situated to play a role in guiding company investments. There are many things an IT department can do to guide the investment process. However, the process begins with accurate data. An IT department needs to reach into the business processes and technology demands of every division, and deliver the services and information required in a timely fashion. The use of an ITPM solution will provide the needed flexibility to present the data your customers require and the information the business decision makers need to hold their departments accountable. When you reach this point, your business will begin to look at IT in an entirely different way. The amount of work required to manually review every technology purchase in an organization is simply overwhelming. For most state governments, procurements of $25,000 and below require so much work that it's cheaper to "take the risk." A better way to address this problem is to make it cheaper and easier to assess technology demand, prioritize your projects, and manage your IT implementations so that smaller and smaller projects can be easily aligned with the business. This setup allows IT investments of any size to be tailored to the business. Most organizations have a dollar value attached to resources that can be spent by any given position. By granting signing authority to managers and directors, company executives are able to focus on more pressing business matters. Regardless of the level of your signing authority, it is assumed that you have enough knowledge to either align the project to corporate objectives, or that the expense will be low enough that partial success will prove sufficient to meet company needs. All companies invest time and money into planning IT solutions, and it is generally accepted that the more time and money invested, the more accurate or successful a project will be. However, technology experts will apply a slightly different approach to this equation. What if you could lower the amount of time and money required while maintaining, or even increasing, the accuracy (or success rate) of your investments? An efficient decisionmaking process will deliver the right data to the right people at the right time. ITPM enables this process. It will allow end users to enter and track demand into a central system with a consistent, transparent set of decision‐making criteria. Then, IT demand can be aligned against corporate objectives and IT funds. This setup allows executives to elevate the projects with the highest return to the business to candidate projects. By elevating specific projects to this status, you can ensure that any time invested is focused on planning, testing, and implementing projects that can have a positive impact on the business. In the previous example, a state budgeting director wanted to implement video conferencing. His department spent several hours researching webcams and various software packages that would allow two or more cameras to connect over the Web. No doubt he was extremely pleased to discover that there are free programs available that will allow you to communicate with voice and video over the Internet. However, that particular solution was unworkable and couldn't handle professional, business‐class communications. As a result, the time invested in the equipment research was written off. Thankfully, the equipment was not actually purchased before the flaws in the system were recognized. Many times, purchases like this simply run through a procurement system with no real checks or balances. If those devices had been purchased, the agency would have had $25,000 worth of hardware sitting, unused, in the office, several days of wasted time, and strained relationships between IT and the director's department because "IT couldn't make it work." As is often the case, small purchases can get through the system with little or no input from IT. With ITPM, you can make it much easier to regulate purchases of any size and ensure that they align with corporate goals. This saves time and money and ensures the maximum return on your IT investment. Providing IT services to an organization is a very complex endeavor. The physical layer of the network will always be a part of the equation, and things like data security and corporate compliance issues will touch every aspect of every project. Technology can easily be thought of as a web. Any time you pull on a single thread, the effects are visible throughout the entire structure. Upgrading your ERP application might mean publishing financial reports in a new format. Older applications that don't support the new format must also be upgraded. This chain reaction continues all the way down to the users, who must learn new applications to do their jobs. With a system that can track user feedback and system changes all the way through a project, you increase your chance of success. Suppose your company decides to migrate from Microsoft Exchange to a Web‐based collaboration system such as Google. Although this migration may sound far fetched, I worked with a global company who recently made this change. During the process, several email forms had to be converted to a Web‐based entry system. The original plan was to use the existing Web servers to manage this content. The project was more than halfway done before the project manager was told that the new Web servers couldn't support the old forms. There wound up being an easy fix to this problem, but what if there wasn't? There was no system in place to collect the required feedback from the Web developers and track their responses. This company could have easily completed their migration and discovered they now had to replace their Web infrastructure to make things work. Collecting and addressing demand manually from so many entry points without a consistent set of criteria always causes problems. Users' needs can be overlooked, requests cannot be prioritized, and the impact of change on people and systems is inconsistent. Without a consistent process that spans multiple projects, results will be varied at best. If you can asses and track IT demand, and the associated costs, you will produce consistent results and predictable outcomes. As a CIO, it is nearly impossible to collect demand data from every department in your organization. If you rely on traditional communication methods, the IT team will receive scattered requests for resources and technology and spend a lot of time assembling those requests into some type of document or report for business decision makers. Under such a process, requests can be misinterpreted, lost, or simply ignored because there is no system in place to ensure they are addressed. To increase customer service and attempt to address every request, many IT departments will incentivize staff members for eliminating multiple requests for the same service or reducing the number of customer complaints. However, this solution merely treats the symptoms without addressing their underlying causes. Electronic request forms let you track and manage demand from every department. This ensures that business demands are being met while prioritizing investments and matching them to corporate goals. Automated workflow can track demand through your business decision‐making process and illustrate potential bottlenecks. Resource management tools give you visibility into changing deadlines and delivery issues; including their impact on the business. Application scorecards allow you to monitor an application's value to the business and clearly illustrate when that value starts to decrease. One of the most difficult decisions to make is when to replace an application because it has a negative return. Once implemented, the executive team has an aggregated view into IT and the services that the department provides. Essentially, you are creating a diagram of the complex web of IT supply and demand, which will illustrate key dependencies and allow you to improve the process of demand fulfillment. This will allow you to create, apply, and track to repeatable business criteria as the primary driver of the IT investment process. A common reason for not investing in ITPM is that it is possible to obtain all this information without it. However, without ITPM, much of the company's time and effort goes into maintaining disparate systems instead of addressing the needs of the business and the customer. Tracking this data in separate applications leads to more work as your team constantly updates multiple reports and diagrams for any single change to a project; it's easy to get caught in a cycle of "constant updating," which has a very negative impact on productivity. Having a central repository for your IT information makes integration seamless and truly illustrates the complexity of technology. Any single change in your IT environment can automatically be assessed from a demand management, ROI, corporate goals, and a host of other metrics that you can customize. Having both broad and deep visibility into your organization can be accomplished in many ways, but ITPM will allow you to consolidate this data and view it through a single, focusable lens. Within most organizations, IT personnel are rarely dedicated to a single project. Even in large implementations that specifically support business objectives, team members are being constantly pulled off projects to deal with situations as they arise. Frequently, this leads to missed deadlines and lowers morale. Furthermore, high‐end IT experts can find themselves working on trivial problems. Although a highly trained staff member may be the only person available to fix an urgent issue, both executives and managers need to understand the associated costs. If you have the ability to track staffing levels against IT demand, you can create a defensible argument for prioritization and suggest changes in corporate priority. Logic dictates that the highly trained technical experts who demand the highest salaries should be focused on projects that yield the highest returns. But in situations where IT support is needed immediately to fix an urgent problem, that highly trained person may be the only one available for a low‐level task. I recall one of my hospital customers who were implementing a security device that would track employee access to private patient information. The device required a full week of work to ensure it was tracking relevant data. Less than halfway through the project, this security expert was directed to address an urgent issue: one of the hospital's top doctors complained about cell phone coverage in elevators. The next six working days were spent designing and implementing a series of cell signal boosters at strategic points throughout the hospital. From a business perspective, this was something that had to be done to provide top‐notch service to hospital staff. The cell booster project focused directly on the hospital's mission of providing top‐quality service. However, the compliance project was delayed for a full week, which delayed the audit process and ended up costing the hospital a significant amount of money. If an ITPM solution had been in place, the demand for increased cell service would have been entered into the automated workflow system. Due to the urgent nature of the request, an executive could expedite the process and immediately perform a cost/befit analysis on how to proceed. Was there someone else available who was qualified to handle installing the boosters and was working on a less‐critical project? Could outside consultants and installers be brought in for less than what was lost by delaying the audit? Could this problem have been solved by purchasing a new cell phone contract for the doctor with a different provider or did the ITPM solution illustrate a trend of lost coverage in specific areas regardless of the carrier? By instantly comparing IT demand information, finances, resource allocation, compliance, and a host of other factors, executives can quickly make informed decisions. This will increase both business agility and efficiency. This same principle can be applied to larger projects with multiple people assigned to them. Because an ITPM solution ties IT demand, investments, and resources together, a change in any variable will immediately be reflected in the others. You will be able to see the business impact of a delayed project and how it affects ROI and even the other projects being worked on. Executive dashboards will display the data that is most important to the viewer. In the previous example, ITPM would have alerted the CFO that his audit deadline was in jeopardy as soon as the security project upon which it was dependent fell behind schedule. Figures 3.1 and 3.2 help illustrate the impact scheduling changes can have on multiple projects. Figure 3.1: The project schedule. 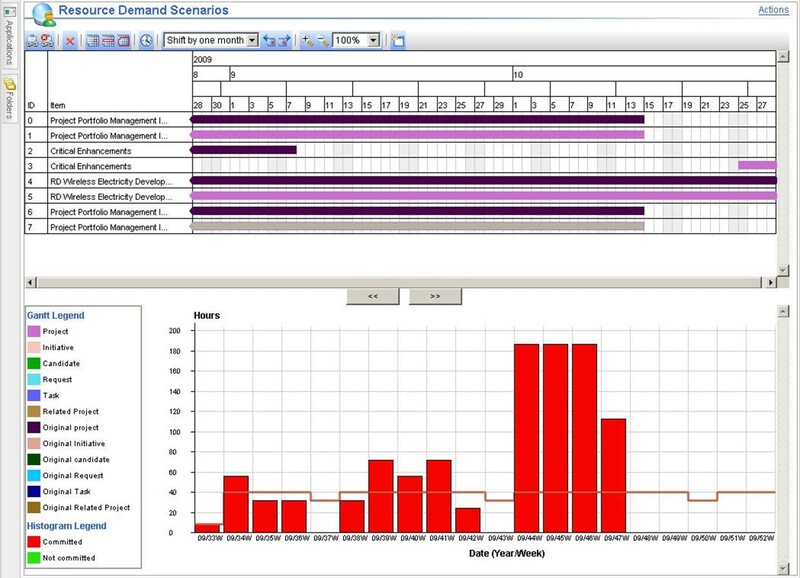 As you can see from the changes in the Gantt chart at the top of the figures, ITPM allows you to compare the original project timelines and schedules, and produces a graph that illustrates the level of demand and the resources available. In Figure 3.2, project changes have been entered, allowing you to compare a second scenario that updates the graph and illustrates the impacts of your changes. Figure 3.2: Project schedule scenarios. There are definitely days when it seems like every department is upset with IT for one reason or another. In many organizations, there exists a constant state of conflict between IT and their internal customers. Most of the time, these adversarial relationships are caused by a lack of communication, even when IT and those specific divisions speak or meet on a daily basis. Frequently, this is due to mismanaged expectations, which spring from inaccurate information. The fact that IT demand and available technology can change on almost a daily basis only makes this situation worse. An area where CIOs seem to frequently struggle is with managing customer expectations. Most IT departments view themselves as a service department for the entire organization, which leads to the cliché of "the customer is always right." Although this may be an excellent mentality to have, and will certainly increase the morale across the organization, it is also a way to avoid responsibility. Yes, IT is responsible for providing the best service possible. Yes, technology should be transparent at worst and a positive experience at best. However, just like any other service provider, IT is responsible for communicating the true costs and benefits of specific initiatives and projects. Would the CFO really insist on installing an application that provides total tracking of every corporate resource and its depreciation rate for $500,000 if he could get 98% accuracy for $50,000? CIOs frequently submit to the demands of their customers and peers because there is no time or data available to make a recommendation. A department wants to use a specific product, so IT procures and implements it. ITPM can change this paradigm, and it is the responsibility of the CIO to transition the organization to this more efficient model. To manage the expectations of multiple departments, you must be able to present clear, concise information about the impacts of specific projects. Line of business managers may only be concerned with the issues in their departments, and executives are too busy running the business to dive into details on specific projects. As a CIO, you must be able to supply business leaders with an IT overview, and at the same time track project progress for specific divisions. This can be accomplished when you have all your data in a single repository, which allows custom, role‐based views into your investments. ITPM offers the benefit of providing objective data to anyone who needs it. People at every level can become emotionally attached to "pet projects" and will reflexively focus on the issues that are important to them. A controller may see an upgrade for the accounting package as absolutely essential to moving the business forward, while the CEO is focused on improving market share by customer hold times. In a situation like this, the assumption is that the CEO is guiding the company and his lead must be followed. But what if the accounting system is so outdated that payables data is frequently misplaced? The only way you can manage expectations up the corporate chain is to present clear, objective data that decouples investment decisions from the emotions that often drive them forward, enabling everyone to focus on business objectives. The CIO is ultimately responsible for insuring that employees throughout the organization understand the consequences of their decisions, and spelling out prior to project implementation what the results should be. With hard data and a defensible argument, you will be able to proactively guide your peers. Executive management is constantly focused on the objectives of the business. The need to maximize shareholder value and produce better results with fewer resources continues to grow. This forces IT to deploy their resources on projects that yield the highest results. At the same time, IT demand is pulling resources away from strategic projects to work on operational issues. Although the need to produce results that maximize IT investments can not be stressed enough, it is certainly possible to neglect operational demand and reduce customer service and IT credibility. In situations where there are simply not enough resources to do both, this deficiency needs to be illustrated to the executive team clearly, quickly, and in terms that they can understand. In a previous chapter, I illustrated how ITPM solutions can quickly and clearly provide the executive team with the resource management data they need to make sound decisions. Once you embrace an ITPM solution, IT supply and demand issues become visible rather quickly. This is the point where the role of the CIO begins to evolve. Given that there are simply not enough resources to meet the demands placed on IT, the CIO can guide the executive team towards investments that will maximize returns. Furthermore, a CIO with accurate data can apply industry and technical knowledge to determine how and when to acquire additional resources to fulfill IT demand. This is the new skill set that CIOs will need to develop, and it all starts by learning about the business and IT needs of every department, not just a select few. IT organizations are responsible for implementing and managing technology to improve operations across all departments. As a result, CIOs can find themselves lost in a series of back‐to‐back meetings that can run for weeks at a time. Understanding the needs of each department is essential to making good investment decisions, but if you are in meetings for 30 or more hours per week, how is it possible to act on any of this information? I know many CIOs who are perceived as ineffective or even negligent because the only people who can perceive their value are the people who attend their meetings. One way to increase the perceived value of IT and the CIO is to implement a system where all demand can be centrally managed and visible to anyone who needs it. Implementing an ITPM solution will not only allow you to communicate the value of IT but also break down decision‐making silos. Sometimes large organizations can make IT purchases and implement projects without the executive team really knowing why a particular department is choosing a certain solution. Although this may appear to increase efficiency by driving decisions downward, it is impossible to verify that a departmental solution will be in‐line with corporate objectives. Departments can even implement solutions that are counter‐productive to corporate mandates like choosing am inexpensive software package that solves a specific problem but has no means to verify whether it is compliant with corporate guidelines. For example, the executive team may decide that customer service levels need to increase while the cost of customer contact has to be reduced. So, a customer service manager needs to implement a Web‐portal that will allow customers to self‐service. This manager will most likely research various products, talk to a few sales people, and initiate a Web portal project. Such being the case, how will the executive team know whether the solution is SOX compliant? With an ITPM solution, a CIO will be able to quickly understand what the project IT is working on for the customer service department. As the project is directly tied to customer transactions, certain regulations such as SOX and PCI might apply. What if there were specific budgets set aside for compliance that have remained unspent? Even more appealing, what if all the projects currently tied to SOX or PCI have produced a negative return, which is troubling the CFO and pushing the internal perception of IT in the wrong direction? If you could illustrate that situation to your peers, then every department benefits; you have found additional implementation dollars and increased the ROI for a specific budget that has been an issue for the CFO. This is the best possible position for the CIO, creating situations where everyone benefits. ITPM will break down the barriers between departments and allow you to map your resources, budgets, and timelines to the business. How many departments are in your organization, and how long would it take you to understand the needs and issues facing each one? CIOs must understand the IT demands of each department and view their technology from an executive perspective. This view is often distorted because you have to depend on disparate systems and non‐objective people. Many departments or divisions may seem to "run themselves" and require little or no attention from IT. However, IT is still responsible if the technology fails to perform. Even with all the new collaboration tools available such as video, email, and telepresence, you have to trust that your peers are telling you what you need to know. You can manually track projects and progress through multiple applications or centralize your information using ITPM. If you have a clearer view into your data, you can remove the subjective perspective. Demand requests, workflow processes, and feedback forms provide an objective starting point for managing IT. They allow you to see the data without personal interpretation and can be both consistent and transparent. Having complete information from objective sources is the only way to ensure sound investment decisions. In order to provide accurate investment data, IT must prioritize and select proposed IT projects and infrastructure investments that support strategic business objectives and balance risk and value. The easiest way to do so is to create business criteria that can be applied to multiple projects. The decision‐making criteria should be consistent, standardized, and weighted according to the goals of the business. Furthermore, they should be agreed upon and communicated to all layers of the organization, including the executives and the governing board. Regardless of the criteria used, the ability to apply the same metrics to every project will increase the odds that IT will succeed. The ability to apply consistent decision‐making criteria to IT investing solves a number of issues that are prevalent in most IT environments. First, the problem of decibel management can be reduced or eliminated. It is much easier to make objective, unemotional decisions about investing when you have your data centralized and can apply specific criteria. No longer will you find yourself working on projects that have little or no value to the company, other than to "quiet someone down." The consistency of IT investment criteria and the transparency of supply and demand data also increase efficiency by reducing the number of redundant projects. ITPM allows any chosen role to view project and investment data across departments as well as how that data maps to business goals. By adopting this centralized approach, it becomes easy to quickly determine when projects or applications are providing redundant functions. Without this level of transparency, departments can develop "islands of automation" that not only drain corporate resources but can ultimately slow corporate growth. In some cases, two separate applications are deployed and maintained, yet they provide the same data to different groups of employees. Certain applications may not be certified for specific compliance regulations that are required company wide. Wouldn't it be preferable to know whether a specific department is adhering to corporate regulations before an audit occurs? ITPM and the consistent, transparent view it provides will allow you to effectively manage your IT investments and enforce specific business criteria for technology implementations across the entire organization. The best way for a CIO to promote and elevate IT while increasing communications and morale within all departments is to enable collaboration. One major reason we all use technology is to get the right information into the hands of the right people at the right time. As technology champions, it is crucial for IT to understand that although moving information between people is a primary responsibility, facilitating communications is actually a higher calling. The corporate environment can foster internal conflict and competition. There is only so much money available to fund projects and grow separate business units. Instead of competing for resources with other departments such as accounting and sales, a CIO might be better off helping other departments increase their budgets or spend them in a way that increases their efficiency. With an ITPM solution, you will have all the objective data you need to assist your colleagues as they build their budgets and allocate their funding and resources. To elevate IT to the role of a business partner, it is necessary to gain the support and respect of your peers at all levels of the corporate hierarchy. IT spans all departments in a way that no other division can, so a CIO is in a unique position to act as a bridge between the executives and their departments. In order for this to happen, IT can no longer be viewed as a corporate utility. Thankfully, as technology advances, this role becomes easier and easier to fill because corporate objectives must leverage more and better technology for the business to grow and compete. However, the amount of risk to the CIO has also increased because regardless of the skills of the person, or the data collected, more exposure to the executive decision makers is inevitable. Without ITPM and the data and decision‐making tools it provides, CIOs will find themselves being held accountable for results that they have no way of predicting. Utilizing ITPM as a tool to foster communication and collaboration and improve the quality of the business is essential to success in today's market. Twenty years ago, accounting departments used special calculators and maintained cabinets full of paper files and receipts. In sales, the term "rolodex" is still used, but I have not seen an actual physical device for sorting and storing business cards for a very long time. This is largely due to the fact that computers and IT have changed every aspect of the way we do business. The idea that the cycle of advances has been accelerating is evident to any corporate executive. Software products are updated frequently, and many companies employ a fulltime person just to keep up with the latest updates and patches. The result of this increasing pace is less and less time spent on planning, which usually results in even more work being done post‐project to actually realize any benefit from new technology. Also, as there is little or no time to plan, communication and documentation are infrequent and inadequate. organization by forming a "communications loop." In the first chapter, I diagramed the IT investment life cycle. This model can be used to manage IT investments and ensure positive results. 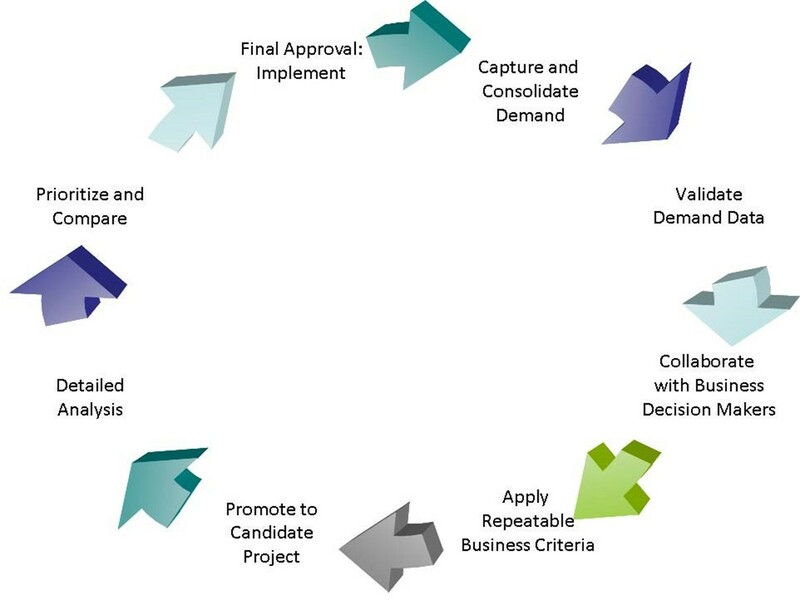 Within the life cycle, there is another model that can be used to assist in the decision‐making process and guide the organization towards sounds business decisions. The communication loop consists of eight steps, and is built into the ITPM model. Figure 3.3: The communication loop. The opportunity for collaboration in this step is to acknowledge the input from employees and let them know they have been heard. When requests for IT products and services are lost, employees think that IT is simply ignoring their needs. With trending information and multiple demand requests, you can examine the existing systems and compare technology. This step validates that the problem can be solved with IT and tends to uncover if there is a need for more training. The systems may be in place, but users are struggling to understand them. If training is not the issue, you have an opportunity to go to the executives with demonstrable proof that you need new technology. Based on the goals of the business, you can evaluate how much benefit a new technology can deliver. By applying financial metrics and market data, the executive team can determine whether this investment is sound. Once you know a positive return is possible, you can put in time and effort to investigate specific solutions. It is important to note that this qualification process saves time spent on researching projects that don't support business goals. This is an opportunity to reach out to all of your peers and get their input on a specific solution. During this process, you can re‐iterate the goals of the business. Once you have collected data and created several implementation scenarios, you will have a clear picture of the return on your investment. This is the point where you know the project is valuable to the business and can show a positive return. This step is where IT becomes part of the executive team. If you have accurate return data, you can discuss your candidate projects with the executive team. While you are working with your peers, remember to use the data you have spent so much time collecting. If you focus on hard numbers and investment returns, you won't be perceived as "playing favorites." If you have objective data for these discussions, you have a much better chance of true collaboration. The implementation phase is another opportunity to foster cooperation. You can act as the bridge between the executive committee and the employees. If you encourage your users to constantly submit feedback, you can stay on track and eliminate roadblocks before they threaten the investment. If your users embrace the process, the cycle will automatically start again. Every step of this process usually takes place in most organizations today. The problem is that there is usually no central system in place to foster collaboration. When you use manual processes, data is lost and IT becomes the scapegoat. If you can implement ITPM and automate your processes, business goals will be communicated throughout the company and your executive peers will have a flexible view that can be instantly refocused on the appropriate priorities. Just like a microscope can view miniscule objects and telescopes can show entire galaxies, ITPM can provide focus on any level of your business. You will have the ability to examine the details of a given implementer's schedule and track the impact of that work all the way up to sweeping corporate initiatives. Although any CIO can do this to some degree without ITPM tools, only by implementing ITPM can you quantitatively change your focus quickly and easily. I suggest the metaphor of a lens to make ITPM easier to discuss with your peers and colleagues. Explaining to a CEO that he or she will be able to "see anything and everything about IT" will certainly be met with skepticism. However, a central repository will allow you to open and manipulate windows into any level of your business. I strongly recommend that when you are evaluating ITPM solutions, extra attention is paid to the views and dashboards available and how easy they are to manipulate. Although the IT team will easily see the value of ITPM tools, executives and other line of business managers will focus on only what they can see and how easy it is to use. This means that the user interface (UI) and the ability to "change focus" when viewing your IT investments will make or break your implementation.